Two new Twitter accounts that call themselves "rogue" representatives for NASA and the National Oceanic and Atmospheric Administration (NOAA) have popped up over the past few days. The accounts, which have no official ties to either agency, are a response to the Trump administration's order for at least four government agencies to stop all communications with the public, according to The New York Times. Other government science agencies have started such "rogue" accounts as well; you can see a full list of the "rogue" feeds here. On the space side, a trio of Twitter feeds (@RogueNASA, @Resistance_NASA and @AltNASA) have cropped up, though, as SpaceNews' Jeff Foust reports, NASA has not been affected by any restrictions on research or communications like those reportedly affecting the Environmental Protection Agency and others. For example, NASA's main climate change website, climate.nasa.gov, remains online and shows the current global levels of carbon dioxide, as well as temperature-rise data and arctic and land ice changes. The @RogueNASA feed bills itself as "the unofficial 'Resistance' team of NASA" and clearly states that it is not an official NASA account, as do the other "rogue" feeds. Tweets from the account have encouraged people to follow NASA's official Twitter accounts, such as @NASAClimate, @NASAEarthand @WomenNASA. NOAA works closely with NASA on Earth observation satellites, weather tracking and climate research. 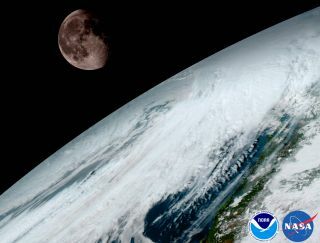 The two agencies launched the GOES-16 weather satellite last November. On Monday (Jan. 23), NOAA unveiled the first spectacular photos of Earth by GOES-16 as it began its observation campaign. The images included an amazing "Blue Marble" view, as well as a jaw-dropping view of the moon and Earth as seen by GOES-16. Meanwhile, scientists across the United States are drawing up plans for a march in Washington, D.C., in response to the Trump administration. Space.com's sister site Live Science has full details on the scientists' march here.